Salt River Tubing is a must-do adventure! You know it’s fun if have done it before, and if you haven’t then what are you waiting for? Here’s a description of what you can look forward to, how to get there, and how to prepare for a fun time. There are different starting points depending on the time of day, water flow, and the length of time that you want to float down the river. We started out at the Blue Point Bridge. Click here for videos and pictures of the adventure. So just after I plopped into a tube, a man in the shade under the bridge said “hey, you worried about getting sun burned?” I told him no problem because I used sunscreen, and crossed my fingers. This was to be the test of all tests. Two hours in the blazing hot Arizona sun! The water seemed shivering cold at first but is perfect once you get used to it. If there is a lot of water being released from the dam then you get to ride through some tame “whitewater” areas and get splashed all over. It seems that no matter where you are on the river you just get sucked into most turbulent part of the whitewater funnel. After this comes the nice calm blissful ride until the next patch of whitewater. If the water gets rough and the rocks get close to your keister just move it up and you will float like a leaf. You won’t believe the views of the Tonto National Forest and the wildlife! Every now and then a fish will jump out of the water next to you. Then there are some black birds with these red patches on their wings (Red-Winged Blackbird), even saw a Great Blue Heron or two. Look up and you might even see a hawk or turkey vulture circling high on a thermal. The smells are good too. Love the desert smells! Especially enjoyed the bulrush wet hay smells when you get around the reeds and grassy areas. Then there are woody areas that have a spicy redwood smell. Close your eyes for a moment and listen to nature. You can hear the songs of birds, the crickets chirping, kids at play, and before long you open your eyes, the rapids are roaring all around you! Salt River Tubing is a very relaxing way to enjoy a hot day in the desert. You can laze in a tube with comfort for hours. Even in the heat of the desert, the water will cool you off. For my California transplants, it sure beats the heck out of lying in the sand and watching waves. When you are done just step out of your tube and go to the bus. Salt River Tubing runs about a half dozen busses so the wait is minimal on the weekdays, could be insanely busy on a holiday weekend though. and Scarface Mountain to the east. 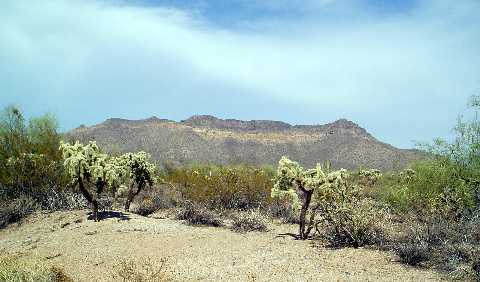 A spectacular side trip is the Usery Mountain Regional Park. This park has lots of fun things to do like camping, archery, hiking, picnicking, etc. You can hike up to the scar in Scarface Mountain when the weather gets cooler. Another good way to get there is drive north on Power Road and it will turn into the N Bush Highway. It's about 15 miles from the 60 freeway. 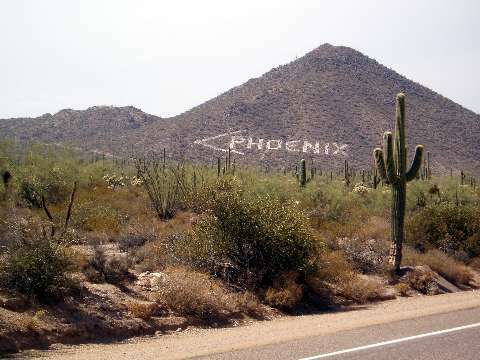 It's in the Tonto National Forest so the tube rental location is easy to spot. The parking lot is behind the buildings. How to prepare for your adventure. Be prepared for the sun. Watch out for sun exposure and bring water. 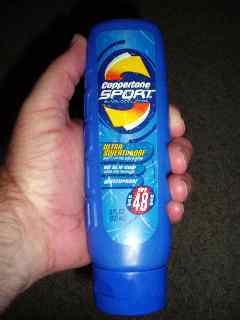 Here is my secret weapon against sunburn: I used a “surfer approved” waterproof Coppertone Sport product that was rated at 48 spf. Here’s how you do it just like a surfer. Before you get there take your time and block-up everything. Even beneath your t-shirt because the sun can burn through thin clothing. Then when you get there apply another coat just before you get your tube. Reapply if you will be in the water a long time. The Salt River Tubing fee is good for all day and this includes tube rental and bus service. Seems like a bargain for the fun you will have. All you have to do is just show up with the correct CASH and your driver’s license. 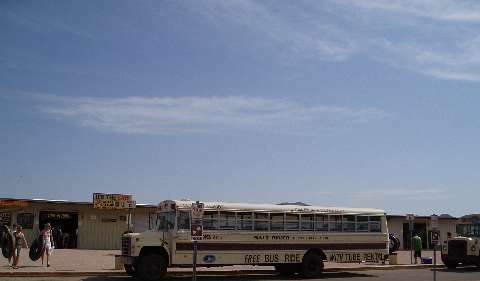 They will give you a huge truck tire tube then you hop on a bus for your trip up the canyon. Kids have to be big enough to fit in a truck tube. So the age limit is 8 years AND 4 feet tall. If you are not a strong swimmer wear a lifejacket just in case. This isn’t Golfland Sunsplash and the only lifeguards are fellow tubers. Hats and sunglasses will make your trip very comfortable. T-shirt’s will cool you off when they get wet and even more when the winds blow. Bring water for drinking and shoes for the rocky bottom. The shortest trip is about 1-2 hours and the longest maybe 5 hours. It all depends on the water flow and when you get there. When you are all done you can drive up the canyon to Saguaro Lake where all this water came from. There's a real cute restaurant called the Lakeshore Restaurant where you can get a bite with a terrific view. Click here for pictures and information about Saguaro lake. Salt River Tubing is a private company and you can reach them at (480) 984-3305. Check their website or call first because the water flow can vary a lot. http://www.saltrivertubing.com/ Tubing is normally open May through September if water flow and weather permits. Last tube rental generally is 3pm. Last I checked their operating hours during the hot summer season is 9:00am-6:30pm 7 days a week. But please double check and call before you go because anything can change with the water and weather.